The government on Wednesday signed a $250 million development policy-operation agreement with the World Bank to support the country’s reform efforts for creating large-scale, better-paid and inclusive jobs. Economic Relations Division Secretary Monowar Ahmed and WB Country Director for Bangladesh, Bhutan and Nepal Qimiao Fan signed the deal on behalf of their respective sides. Newly appointed Finance Minister AHM Mustafa Kamal was present at the programme as the chief guest. The credit is from the World Bank’s International Development Association (IDA) has a 30-year term, including a five-year grace period, and carries a service charge of 0.75 percent and an interest of 1.25 percent. 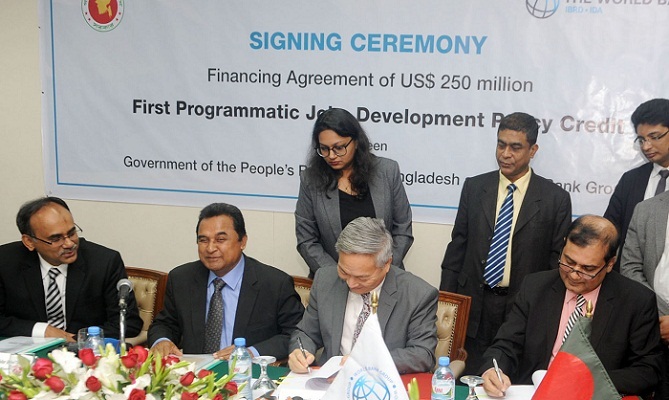 The Programmatic Jobs Development Policy Credit -- the first of a series of three planned operations -- will help Bangladesh build a stronger policy and institutional framework to create faster and more inclusive jobs for citizens, including women, youths, overseas migrants and vulnerable members of the population. “Jobs are cornerstone for development. Bangladesh needs to create more and better jobs, particularly in the manufacturing sector to achieve its growth aspirations,” said Qimiao Fan. The programme takes a comprehensive approach to overcome the barriers to job creation. It aims to help leverage Bangladesh’s comparative advantage in the manufacturing sector while stimulating investment, making doing business easier, and modernising customs and trade facilitation. To ensure workers’ protection, it will also help implement amendments to the labour law and reform the pensions programme. In recent years, the pace of job creation has slowed, especially for women and youths. They are often engaged in low-quality informal jobs with weak protection for workers. Further, Bangladesh is one of the most vulnerable countries to climate change. A recent study shows that a 15 percent increase in the share of non‐agricultural employment would significantly reduce the impacts of climate change on living standards. The programme will support reforms to help Bangladesh create jobs sustainably by adapting to the rapidly changing environment as well as managing the risks related to climate change. The programme will help the government’s ongoing initiatives to create labour intensive quality jobs while laying the foundation for a more resilient economy and stronger social protection, he said. With 36 percent of women in the labor force versus around 82 percent of men, women face more challenges in accessing quality jobs. The program will help increase female labor force participation by making childcare more available for working mothers and targeting women and youth with training and employment services.